Businesses who understand their complete customer journey can capitalize on opportunities and unlock the full sets of experiences lead to sales. There are two basic ways in which we can break down the complete customer journey, and we can use either of these to model how we want to attribute channels across the marketing spectrum. Measuring true ROI and the impact of our marketing efforts on the business depends on our attribution model. But hold up…I am getting ahead of myself. What is the customer journey and what are channels, attribution, and the marketing spectrum, you ask? Let’s break out the chalk and chalkboard! Channels are targeted sources that produce traffic for your brand, website, company, store, etc. You can think of channels as places where people find out about your products and services. Advertisements and social media are the most common channels right now. Because these types of channels are easily measurable, they are insightful. By understanding what channels your consumers are interested in, and adding your content to those targeted sources, you will be able to send specific traffic to your brand. Attribution is being able to identify the source, or channel, of traffic coming to you. If a potential customer walks into your business because they read about it in the newspaper, then the newspaper is responsible for sending them to you—that is the channel that you can attribute to this new customer. The age old problem that can occur with determining accurate attribution is figuring out which advertising source/channel deserves credit for sending a customer to your business when that person may have read about you in the newspaper and also saw a billboard advertisement. We will delve further into this issue a bit later. The marketing spectrum is the full range of activities that you are performing to engage with customers in order to build value for your brand, sell products, and deepen relationships. Activities may include emailing, calling, texting, advertising, social posts, and sending direct mail. Since there are numerous ways of interacting with customers, it is important to consider all the different channels and activities in those channels that are contributing to building your business. What is unclear about multi-channel attribution? 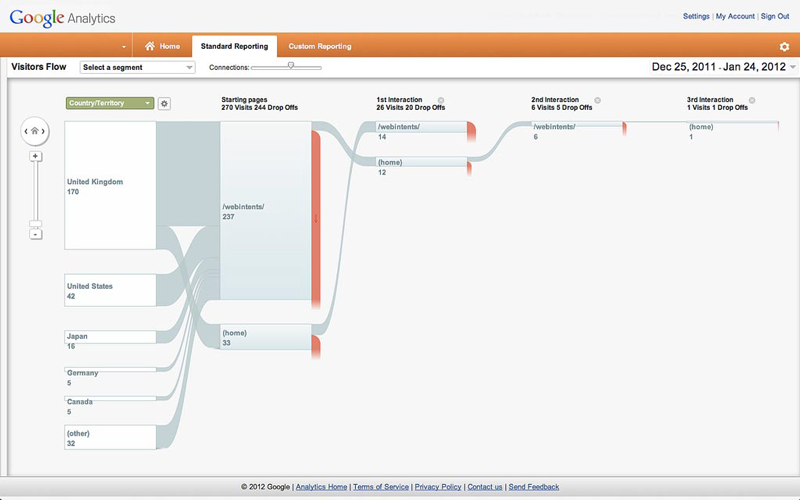 Bringing clarity to multi-channel attribution tracking is best illustrated by the models that attempt to describe the fluid dynamics of the process. Before we get into the models, let’s focus on the concept. Consumers will digest or consume lots of content/information from the channels they prefer. For example, when you launch an Instagram only campaign, you’ll miss your targeted audience who doesn’t have Instagram. Sounds obvious, right? Small and medium sized businesses assume their customers are only in a few channels. However, without good data, you don’t know what you don’t know. You would need to hit as many channels as possible to correctly determine which channels your customers are actually consuming information from. In order to clear up the attribution problem inherent in multi-channel marketing, you need to first understand the role of your channels as you scale. Once you do this, you can see why accurate attribution is a struggle. Unless you can attribute channels correctly, you will not know the true impact of that channel on ROI. Your consumers are more than likely in all of the channels. Just based alone on the above image, this seems like a lot of marketing channels—and it is. But truth be told, there are many more. Anywhere a consumer can interact with your business in a tangible or digital way – that’s a channel you need to be in. (Tip!) If you’re feeling overwhelmed, a great place to start is by looking to your competitors to see what channels they are in. Where to start with multi-channel marketing? Website (CMS) – You need a digital location no matter what type of business you are; this is foremost the most important thing. Search Engines (SEO) – You create a presence in search by creating quality and relevant content that corresponds with the products you sell and what your ideal consumers want to know. 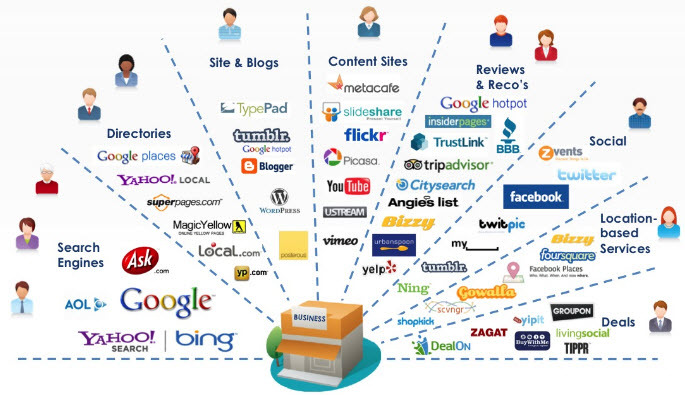 Social Media/Listing (Distribution) – You need to get your content to people who need it. For people looking for your services or products that you offer, you must have a social presence in order for them to find you on listings or review sites. Ads, Email, and Sales (The Funnel) – This is the final step that allows you to build your marketing “machine.” The machine will help you drive traffic to your content, convert consumers at the end of their journey into leads, and eventually move them down the funnel from a lead to a sale. Once you have the primary channels out of the way, you can begin inserting your business and managing your presence across the entire spectrum. This exercise should help you see the role of each channel for your individual business. A word of warning: scaling into more channels requires more content, which always requires more time. As you widen your breadth of channels and learn more and more about your ideal customers, stay mindful of the time constraints this presents to your business. Last Click is the most popular because even if your cookies or tracking is unreliable, this will always deliver reliable results based on a consistent method. Google has their own write up comparing models present in Google Analytics you can utilize in reporting. Last Click attribution is attributing the final channel’s click through to the source of lead generation. Assuming several channels (which could be near infinite) had touches to the consumer along their complete journey, Last Click will attribute the channel that they touched last to receive the credit in converting that lead. Example #1 – A consumer sees an advertisement on television, and then sees that advertisement again later on YouTube. Later, they get an email promoting the advertisement, and finally they decide to Google the company before buying. In this example, Organic search gets the credit and the attribution for converting that person into a lead. Most reliable for cookie based tracking. Negates contribution of prior channels. 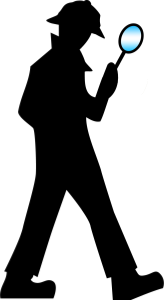 Simplest to use; usually the default model. Doesn’t usually reflect marketing efforts. First Click attribution is the reverse of Last Click. The first channel that brought someone into all of the other channels is given the credit in lead generation. Assuming again that there were several channels (this could be near infinite) that had touches to the consumer along their complete journey, First Click gives attribution value to the very first channel we had tracking information on. 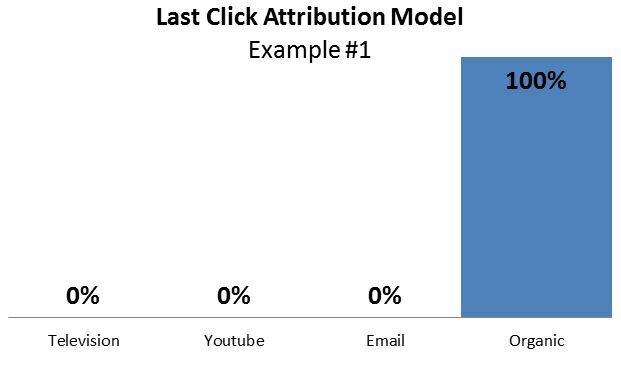 As I mentioned, most attribution models prefer Last Click because of the unreliability in tracking. 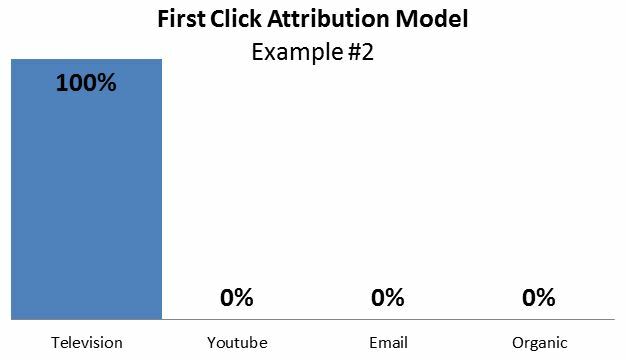 First Click attribution is the most susceptible to unreliable tracking. For example, if someone deletes their cookies from a cookie-based tracking system, then you get unreliable first clicks, as their first channel will be reassigned after their cookies were purged. Example #2 – Imagine that a consumer sees an advertisement first on television, then watches the advertisement on YouTube. They then receive an email promotion for that advertisement, and finally they search and convert to a lead from organic search before buying. In this example, the very first click or channel, namely television, will get the credit for the attribution. Emphasizes awareness strategies. Most unreliable cookie based tracking model. Used in brand awareness and political campaigns. Entry channels over-weighted. Linear Attribution modeling was statisticians’ go-to before exploring years and extended data. In statistics, it is a rule of thumb to first assign all weights a consistent value before attempting to individualize the weighting of every element. Based on this assumption, I would assume this is where linear became a popular marketing model. The purpose of assigning equal value along the chain is that it may be too complex and we may not actually know enough to weigh any specific channel greater value than another. This model excels at awareness and recognition strategies, but does not help you do much else. 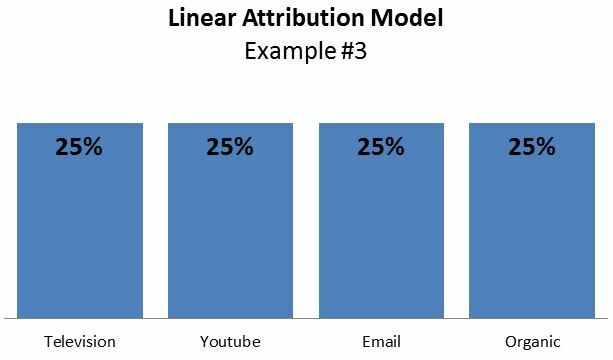 Linear Attribution also has the flaw that if something did have a greater impact on the whole marketing spectrum, we would not be able to identify it correctly. But keep in mind—there are marketers that swear by each and every model, so do your research to determine which model best suits your business. Example #3 – Assuming the same story as the examples prior, each click along the complete customer journey is assigned equal value as long as the consumer eventually converts. Simplest (think statistician). Nothing is given uneven weights. Does not emphasize any particular strategy. Cookie cutter marketing strategies. Time Decay attribution is a confusing model as you need to know at which point the greater credit is assigned to a channel. In Time Decay modeling, the channels at the end of the consumer journey receive the most credit and the channels at the beginning receive the least. The channel at 50% of the consumer journey would therefore receive 50% of the weight. Time Decay is helpful if you see a lot of your channel traffic from season and clustered events. You can weigh conversions nearest to the channels that led to a conversion more and give less credit to channels that contributed in a time period that may not have contributed to the consumer’s final decision to convert. Again, decide what model best reflects how your business does marketing and match the model to the type of improvements you want to focus on. Example #4 – Assuming the same story as the examples prior, each click along the complete customer journey is assigned increasing value as long as the consumer eventually converts. Another way to describe it is that each click’s value decays over time as more channels and clicks are added. Gives credit to clusters of clicks. Assumes that prior clicks are worth less. Helpful if you have most of the market share already. Favors a bottom of funnel centric strategy. 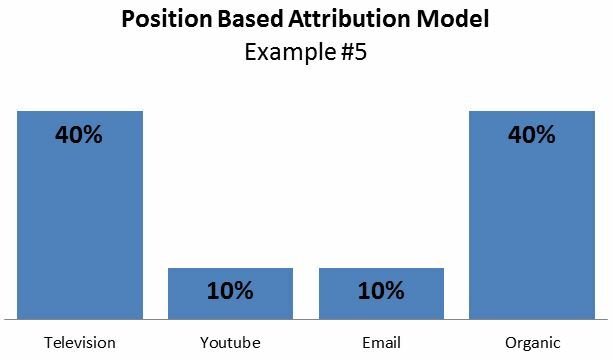 Position Based attribution modeling is one of the models that actually favors a certain type of marketing strategy. 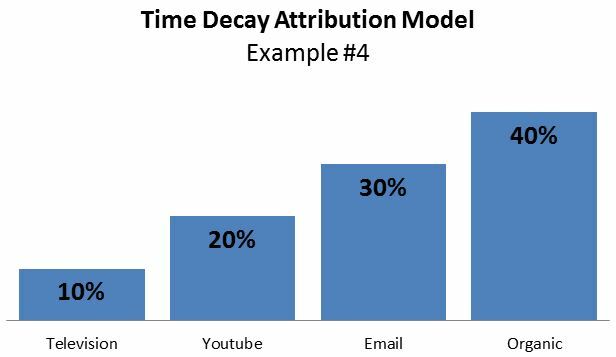 Position Based attribution favors straight lead generation as it gives credit to the beginning channel that brought someone in and the final channel that converted. This is why it has a U shape, as seen in the diagram below. The position based tracking does suffer from cookie based tracking, as does any model that relies at all upon reliability. However, this model does have strengths in giving credit to marketing efforts at the ends, where the big impact actions happen. Giving credit to the end and beginning gives credit and therefore rewards the acquisition channels of marketing; which is why it lends itself to lead generation strategies. Example #5 – Assuming the same story as the examples prior, each click along the complete customer journey is assigned a value, but when the conversion happens, the first click and the last click are given much more credit. Focuses on two important clicks. Doesn’t help you build complex strategies. Leans towards lead generation strategies. Ignores values of relationship building. I could go on with the other 7 or so advanced attribution models and another dozen or more of the super advanced or specialized attribution models, graph them, and weigh their pros and cons, but I’d rather touch on how all of these are implemented and tracked, as that is the intent of this article. Middle of Funnel or W-Shaped Attribution Modeling – This model brings the valuation of channels that extend into channel actions at the middle of the funnel but not up to the point of a completed sale. First or Last Touch/Email/Conversion Based Attribution Modeling – Here, a specific type of action with a channel identifies as the first or last attribution; giving it full credit for the role in creating that touch. First or Last AdWords Attribution Modeling – Google points out this type of attribution model in its description of analytics models you have to choose and report on. The benefit here is that you give credit to search marketing efforts solely – in order to calibrate paid search and make it more efficient but it somewhat ignores the other channels. To me, this modeling is more ad-hoc. Full Funnel or Z-Shaped Attribution – Full Funnel is similar to linear modeling, but the model extends beyond a conversion or initial sale to the final sale and weighs all of the channels that have an impact along the way with equal credit. This is the most widespread channel attributor but it does not specifically weigh any one place in the funnel as more important than the rest – a concept that bottom or top of funnel marketers scoff at. Attribution Modeling in R – Analyzecore has a great article discussing the practical concepts of modeling in R code or algorithmic systems based modeling, the point of which is to conceptualize the flow and customize it to any model that is desired on the fly. This and other models that rely upon more complex algorithms are expandable if you have the desire and need to dig into your data on a highly granular level. Hinted at throughout this article is that the problem with attribution modeling comes down to reliable tracking systems. As a consumer progresses along their multi-channel journey they should be tracked so that every touch with a channel is measured to see, at minimum, that it happened. But there are some struggles with even getting that much information because of the way we track that kind of interaction. As marketing teams add new tools and measurement analytics to their stack, they end up adding a silo of information that is separate from all of their other tools. In order to merge and connect that information, it requires setting up integration or API connections so that the technologies in your stack share and consolidate information. This is great when all of your stack tools cooperate or a nightmare if you are stuck exporting into CSV or XLS files and swapping that information around. All marketing tools assign a unique identifier to every single point of data that is connected back to the source of that connection, typically a consumer. Consumers are often listed in marketing tools with all the data that corresponds to them (tools vary), but there is always a way for their systems to deal with duplicates. This is usually done with unique identifiers, or sometimes it is done with emails as these are the most basic unique identifier in the industry. Other systems provide long hex codes with near impossibility of duplication in order to ensure that every single person is accounted for (and it actually works). Since they have been referred to multiple times in this article, let me simply clarify what cookies are. Cookies are miniature databases stored in the web browser of users which allow us to literally “follow the user.” Non-cookie based tracking does an end around the storage of information in the user’s browser and skips all the pitfalls of cookie based tracking, but requires elaborate privacy controls. For more information on cookie vs. non-cookie based tracking, check out my previous article here. There are always pros and cons, but the point I want to make is that (for analytics) consumer information is tracked into marketing stack tools and linked to identifiers based on the robustness of tracking. Gathering the information is the first step, and because of that, makes all future steps dependent upon the quality and robustness that comes from tracking and inputting that data. This is why it is crucial to have reliable tracking as your ability to assign correctly is based on having enough information to make the consumers in the database distinct from each other. Further, it is vital that we measure; otherwise we cannot improve – hands down. Measuring is dependent upon having properly assigned consumers in our database, and upon robust tracking inputs. Having any data is great. Even 50% accuracy of data gets us 50% of the way to 50% right and wrong decisions. Having no data and making decisions is called “Empirical Decision Making” and it’s best summarized as shooting from the hip. (Tip!) 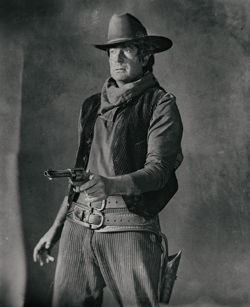 Avoid it at all costs; do not shoot from the hip when it comes to making marketing decisions! How do you attribute all of your marketing (which relies upon measurement) from the consumers (which rely on assignment) back to the channels that triggered those interactions (which relies on tracking)? You cannot even being to model your attribution and give credit to channels unless you understand the reliability of your entire spectrum. Identify holes that you have, so that you can see where there is drop off in channels and assess whether that is a content failure or simply a tracking issue. 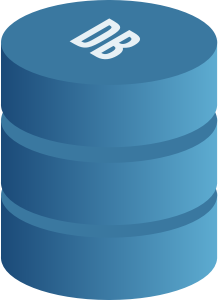 Utilization of UTM standards and standardized naming conventions to go along with them is key. Cross-train marketing members on your team to help them understand the value in tracking as it applies to measurement and goal attainment. If you are interested in learning more about CallSource’s Digital AI tool, a non-cookie, highly robust tracking system, pull out your checklist and check the box next to awesome tracking software because this tool does it all. Should Your Dealership Utilize a BDC for Fixed Operations?